The Leading Economic Indicators for May 2014 highlights trends in Consumer Price Indices (CPI) and inflation, interest rates, exchange rates, international trade, agriculture, energy, manufacturing, building and construction, tourism and transport. Consumer Price Index (CPI) increased from 148.20 points in April 2014 to 149.70 points in May 2014. The overall rate of inflation increased from 6.41 per cent to 7.30 per cent during the same period. During the month of May, the Kenyan Shilling depreciated against most major currencies except the Tanzanian shilling. The average yield rate for the 91-day Treasury bills, which is a benchmark for the general trend of interest rates, increased to 8.82 per cent in May 2014 from 8.80 per cent recorded in April 2014. The inter-bank rates increased to 7.77 per cent during the period. The Nairobi Securities Exchange share index (NSE 20) declined by 1.35 per cent from 4,949 points in April 2014 to 4,882 points in May 2014, while the total number of shares traded went up from 728 million to 854 million shares during the same period. The total value of NSE shares traded increased substantially from KSh 15.8 billion to KSh 23.0 billion over the same period. Broad money supply (M3), a key indicator for monetary policy formulation, increased from KSh 2,100.6 billion in April 2014 to KSh 2,129.9 billion in May 2014. The first quarter of 2014 experienced a relatively stable macroeconomic environment despite interest rates remaining comparatively high. Inflation rose moderately but was nevertheless contained at an average of 6.78 per cent during the first quarter of 2014 compared to 4.08 per cent in the same quarter of 2013. Over the same period, the Kenya Shilling registered slight fluctuations against the US dollar, the Euro and the Tanzania Shilling and appreciated strongly against the Japanese Yen and the South Africa Rand while it depreciated significantly against the Sterling Pound. 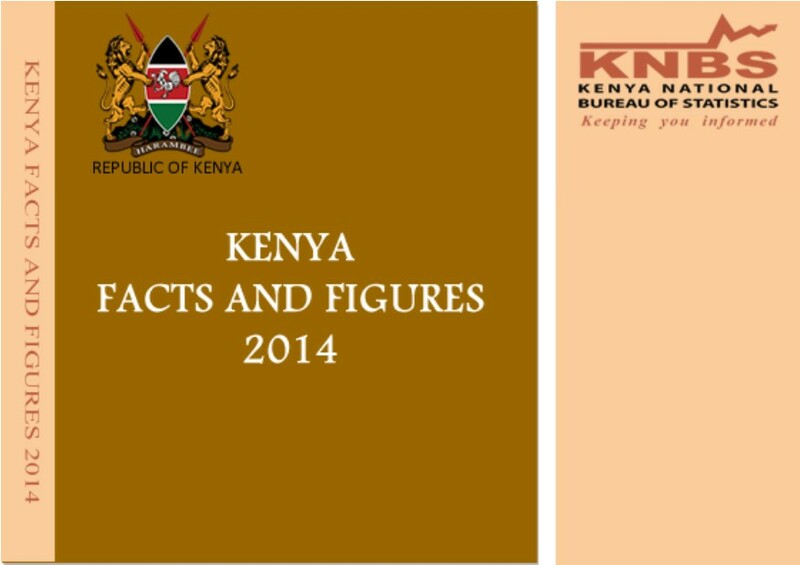 Kenya Facts & Figures is your direct route to Kenya’s economy through reliable statistics. It enables you to have a complete picture of the Kenyan economy from a single source. This booklet provides, at a glance, a comprehensive picture of Kenya’s economy covering all sectors as well as reflecting the various trends over the last four years. 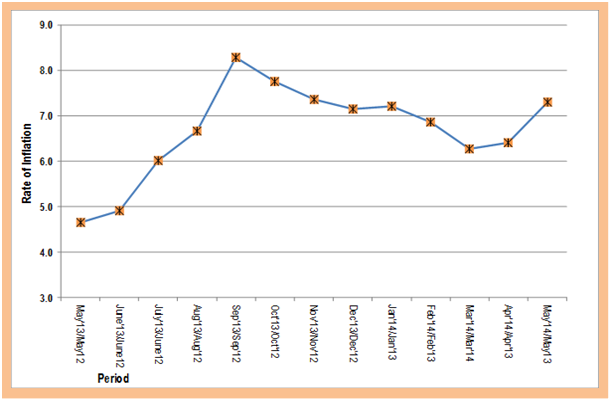 Kenya National Bureau of Statistics hereby releases Consumer Price Indices (CPI) and inflation rates for June 2014. These numbers have been generated using data collected during the second and third weeks of the month under review. The prices were obtained from selected retail outlets in 25 data collection zones located in 13 urban centers. The CPI increased by 0.14 per cent from 149.70 in May 2014 to 149.91 in June 2014. 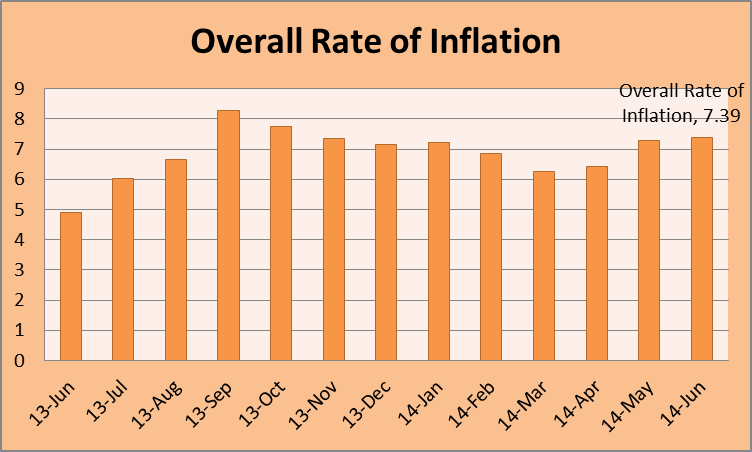 The overall inflation rate stood at 7.39 per cent in June 2014 up from 7.30 per cent in May 2014. 1. What is Kenya Demographic and Health Survey (KDHS)? The Kenya Demographic and Health Survey is a national research activity designed to collect data to monitor the population and health situation in the country. 2. Has the KDHS been conducted before in Kenya? Yes. The KDHS was conducted in 1989, 1993, 1998, 2003 and 2009. 3. What is unique about the 2014 KDHS? The 2014 KDHS is unique as it is the first survey designed to provide demographic and health indicators at the county level. 4. Who will participate in the 2014 KDHS? All women aged between 15 and 49 and men aged between 15 and 54, who are residents or visitors in the selected households. Also, all children aged 6 and under will be measured height and weight. 5. How are participants selected? KNBS has a Sampling Frame, which is updated after every Population and Housing Census. Households are selected at random from this sampling frame. The selected households are used to represent other households in the entire country. 6. What information will be collected during the 2014 KDHS? The 2014 KDHS will collect information on, among others, maternal health and mortality; antenatal and postnatal care; infant and child mortality; nutrition; breastfeeding; child health; family planning; fertility and fertility preferences; female genital mutilation; fistula; domestic violence; tobacco use; HIV/Aids knowledge, attitude and practice; malaria; household and respondent characteristics, and other health related issues. 7. How long will the KDHS take? The exercise will take 6 months, from May 2014 to October 2014. 8. Who is conducting the KDHS? The KDHS is being conducted by the Kenya National Bureau of Statistics. KNBS is the principal Government agency for official statistics. To conduct this exercise, KNBS has partnered with the Ministry of Health, National Council for Population and Development and some development partners. 9. Must I participate in the 2014 KDHS if I have been selected? It is important to participate if you have been selected. If you do not participate, the Government will not have the necessary information to plan health programmes in your area, and in the entire country. 10 What will happen to the information I give? The information you will provide to KNBS researchers will be treated in confidence, as guaranteed by the Statistics Act, 2006. Your information will be stored in KNBS. It will not be revealed to a third party and it will be used for research purposes only. Herufi House, Lt. Tumbo Rd.